Time for a cup of tea? Are the munchkins sleeping? 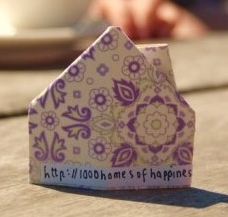 My super creative and clever sister has a little (BIG) blog project underway where she plans to 'release' 1000 origami homes.... just because. She writes a word on each home and posts about her life as a working Mama of three little ladies and their interactions with the world. I thought I would share it with you as I find her blog inspiring, beautiful and full of ideas. I have no doubt that after reading, you will leave with a smile on your face and even better you can get involved by requesting to 'release' a home of your very own. I am quite fond of my blogging sis! You may also get the chance to meet her as one of our retailers at the upcoming Woodend 1st Birthday Market, where she will be selling her quirky children's paintings. On the condition that she never publishes embarrassing childhood photos of me on her blog ever again. What better time to introduce you to her blog when she is giving one of these very paintings away! Looking forward to your first market.